The laid-back waterfront community known as “The Cape,” is a wonderful place to buy a home and an ideal destination for those that enjoy a boating lifestyle. Located in Lee County, the community of Cape Coral, Florida, has an abundance of shopping and dining options, as well as several family-friendly attractions. Among the most popular family destinations are the Four Mile Cove Ecological Preserve, the Sun Splash Family Waterpark, Mike Greenwell’s Family Fun Park and the 27,000 square foot Eagle Skate Park. Nestled in Southwest Florida, Cape Coral is a bedroom community of Fort Myers and boasts more than 400 miles of canals, more than any other city on the globe. The real estate of Cape Coral is comprised primarily of single family homes in charming pre-planned neighborhoods and subdivisions. Within Cape Coral you’ll find waterfront properties and city homes for sale in a very broad price range. The cost of a Cape Coral home depends upon the property’s age, size, location and special features. For example, a two bedroom, one bathroom condo with approximately 800 square feet of living space will cost around $45,000 to $62,500. A single family home in Cape Coral with three bedrooms, two bathrooms and around 1,600 square feet of living space will have a listing price near $145,000. Larger and more luxurious homes naturally have higher listing prices. For example, a 4,000 square foot, five bedroom home in Cape Coral will likely list for $1.5 million to $4 million, depending upon the location and special features of the home. Whether you are looking for a vacation home or primary residence, Cape Coral is a great place to purchase a home. Boasting a gorgeous temperate climate, Cape Coral has convenient access to the Gulf of Mexico, as well as lush forests and an abundance of recreation opportunities. Among the many outdoor activities that can be enjoyed in Cape Coral, fishing, boating, hiking and biking are among the locals’ favorites. Cape Coral is composed of 120 square miles and home to numerous attractions including the Cape Coral HIstorical Society Museum, the Coral Oaks Golf Course, and many others. 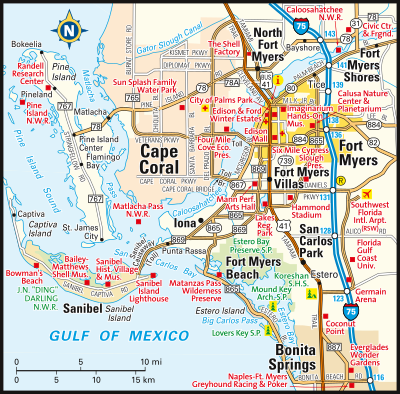 Home to around 181,000 residents, Cape Coral is a must-consider destination for anyone looking to buy a home in the Fort Myers area. If you would like more information regarding homes for sale in Cape Coral, Florida, please do not hesitate to contact us today.